This week’s Tech Tuesday was written by Imagine! Charles Family SmartHome staff members Alex Prokop and Christopher DiRosa. Thanks for sharing! The Imagine! team at the Charles Family SmartHome in Longmont are excited to share news about residential efficiencies that we’ve been implementing over the past several months. Our team has been utilizing an iPad to synchronize a shared house calendar of all individuals’ appointments, outings, and important reminders for team members during shifts. We have also synchronized this shared tool with staff smartphones, as well as with house computers to provide a singular information. This has been effective in coordinating a wide range of activities and tasks from group outings, to tracking healthcare observations to identify and report health concerns to nursing, as well as new doctor orders. By utilizing the iPad in this manner, our team is ensuring that all individuals are getting the highest level of care from staff by keeping our team informed and on time for appointments. Additionally, information and medication changes are being communicated more easily across multiple departments in a timelier manner. The iPad has also been integrated with MedSupport to create a mobile platform for medication administration anywhere in the house or in the community where we have Wi-Fi access. This mobile tool has also been set up with a singular email with direct communication with our house nurse and other key staff so that important changes to medication or care needs can be accessed and acknowledged with greater efficiency. Through these enhancements, we at the Charles Family SmartHome have seen a trending reduction in medication errors at the house over the past three months. Video conferencing has also been established so that house leadership, parents, guardians, and other team members can easily contact the house from off-site location using video conferencing applications like Facetime. Residents are also using technology to develop their independence as contributing members of the Longmont community. 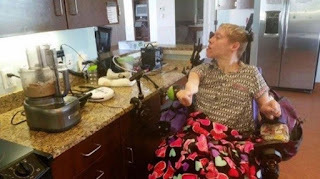 Shelly is pictured above using a Powerlink attached to a simple switch on her wheelchair to help puree her own food. Other residents have used the Powerlink to help prepare meals for the house, grind coffee, and to bake cookies. Residents are also using the iPad to increase their own skills and independence around the house and personally. Additionally, residents have used online resources to register to vote, shop online, and make online purchases. Anthony likes using an application called My Journal (available for Android and Apple). He uses this application to talk about his day and his emotions. He accomplishing this by speaking into the iPad that uses built in dictation on the device. 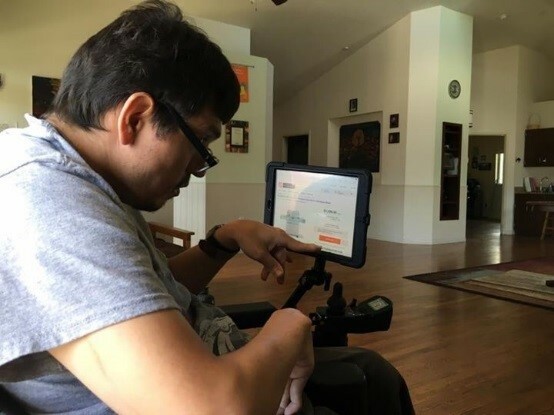 Anthony also uses the iPad to contact his family and friends using Facetime, and to check-in with Facebook to keep up with the news of the day with friends and family. 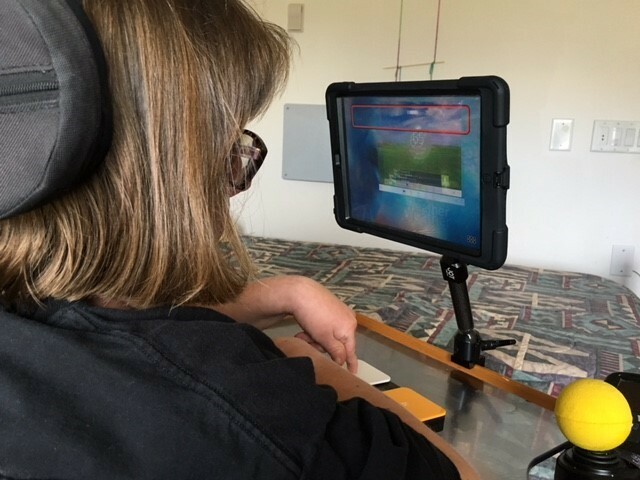 Stacey enjoys using the iPad to check the daily weather forecast and to update the house to ensure we’re all informed and prepare for the day accordingly. She does this by first identifying the weather app and then using a new wireless Bluetooth switch that is connected to the iPad so that she can navigate applications with minimal staff support. Our team is also revamping a number of CU Engineering projects that teach and reinforce cause and effect. As a team, our eye is always on the future! It is our job to seek out new tools and resources that are being developed each and every day to learn, and to become exceptional direct care professionals.